Tomato is a versatile food that makes a great contribution to Americans’ meal plan. It can be called either a vegetable or a fruit, but it’s delicious and easy to eat, no matter it’s eaten raw or cooked. And on top of that, tomato’s a nutritional food, for it’s high in biotin, molybdenum, copper and potassium along with all kinds of vitamins, but naturally low in sodium, saturated fat, cholesterol and calories, which are harm to our bodies. Numerous studies have concealed that the more tomatoes people eat, the lower risks they’ll take to get a cancer, especially cancers like prostate, lung, stomach, cervical, mouth, pharynx, throat, rectal and ovarian cancer. This is mainly due to the lycopene that is contained in the tomatoes. It has also suggested that cooked tomatoes contain more lycopene than raw ones. Tomato is also an ideal food for diabetics to control blood sugar levels for it’s low in carbohydrate, which is harm to control the urine glucose level. 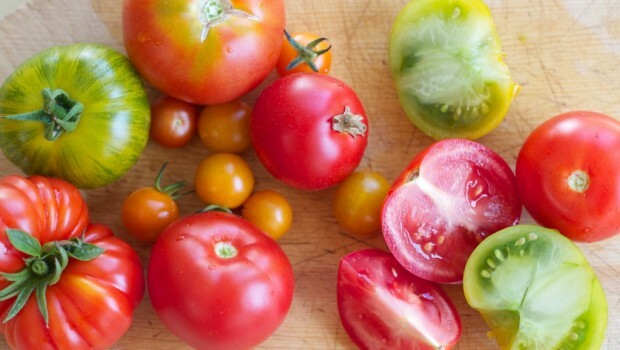 Meanwhile, chromium and antioxidants presented in tomatoes also help regulate blood sugar as well as fiber. Lycopene and antioxidant contained in tomatoes are a good source to help make your skin look great. Moreover, it can also help you get rid of the skin problems such as large pores, acnes and rashes. It is well known that tomatoes contain a large amount of vitamins, such as vitamin A, C, E, K and B6, B1, B3, which are all good to our hair. They make our hair stronger and make dull, damaged hair more shining. At the same time, the acidity present in tomatoes also help balance the PH levels in your hair, which will recover your hair’s natural color. The various vitamins and calcium contained in tomatoes are another benefit for us to support bone health. And tomato lycopene also play a special role in strengthening our bones. Recent studies have shown that vitamin A and C can help improve our vision, especially help reduce the risk of macular degeneration. Since tomatoes contain bountiful vitamins, they are sure to benefit our vision. Tomatoes are full of fiber and lycopene, while quite low in fat and calories. So if you’re determined to lose weight, then tomato’s a good choice. Chronic pain is known to involve chronic inflammation, and bioflavonoids and carotenoids that are high in tomatoes are anti-inflammatory agents that help us get a pain relief.